NEC’s Smart Enterprise solutions leverage technologies to optimize business practices, drive workforce engagement, and create a competitive advantage. Communications technology is rapidly changing. Competitive businesses come in all sizes, but successful enterprises always have one thing in common: great teamwork. In the age of increasingly disparate working locations and job complexity, communications play a crucial part in achieving business success. Today’s smart enterprises must be powered by smart solutions. That’s why NEC provides you with the broadest range of industry specific communications solutions—so you can easily make quicker, more informed business decisions, drive loyalty, and keep ahead of your competitors. Today’s economic environment is a challenge for businesses of all sizes. To stay competitive, enterprises need to have the right tools to be more efficient, flexible, and productive. That’s why NEC has built smart enterprise solutions, so you can optimize business practices, drive workforce engagement, and create a competitive advantage. Work together-even though you’re apart. Competing in today’s business environment requires agility—when meeting challenges, making decisions, and delivering products and services. With more than 115 years of excellence in both Information and Communications Technologies (ICT), NEC shares its vision through its award-winning communications technologies. The smart enterprise innovates by leveraging the best and most current information technologies, tools, and products. NEC has created a full set of unified communications and collaboration applications that operate in conjunction with our telephony products, acting together as part of a fully converged easy-to-use IT solution. NEC’s experience and innovation enable new approaches to how IT services are managed and delivered. Cloud delivery, business agility, real-time collaboration, and reliance on assured services are becoming essential foundational requirements for the success of the smart and secure enterprise. These pillars are part of a rapidly evolving technology foundation by means of which NEC is creating new ways for businesses to grow. Interruption of communications services means downtime for your business, your customers, and loss of revenue. No one wants a communications system that’s difficult to use and even harder to maintain and protect. 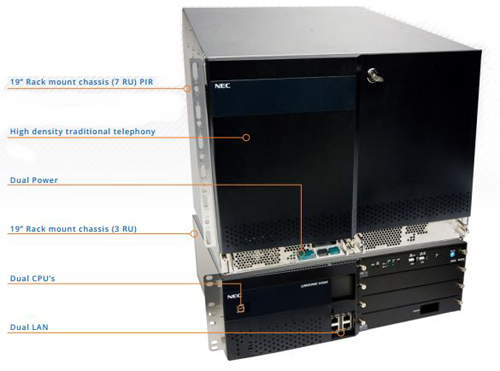 That’s why NEC’s SV9500 platform is one of the easiest to configure Unified Communications systems on the market. The SV9500 easily integrates with existing IT technology as a fully interoperable digital or IP system. The user-friendly management interface streamlines system administration, giving your IT department one personalized portal to administer the entire communications system — Voice, Unified Communications, and Voicemail — all from one central location. Intelligent decision making starts with qualified information. The SV9500 offers an extended 5-year warranty and future-proof technology that meets the demands of your multi-generational employees. NEC has the highest level of customer satisfaction among Unified Communications vendors, and also brings you an incredibly smart investment. Our Unified Communications platforms have been recognized by industry experts as having some of the lowest total costs of ownership on the market. Connection and collaboration are key to keeping communications running swiftly in any organization. NEC’s SV9500 UC for Enterprise suite of applications gives you the communication tools you need to streamline communications and information delivery. With this powerful, manageable solution, your information is centralized and messages unified, so your employees can efficiently manage day-to-day business and communications easily. SV9500 UC users are able to dictate and manage how, when, and where he/she wants to be reached via the desktop and mobile clients. And with the help and inclusion of single number reach, an integrated softphone, call forwarding, and voice/video conferencing and collaboration you can ensure that your customers are able to reach whomever they need to, when they need to. SV9500 UC provides you with the option of using the desktop client as a standalone application or integrated with your Microsoft® Office Outlook® client. With SV9500 UC, your employees retain ownership of their communications. They set their schedule, and their phone rings accordingly. They launch a meeting or customer service session, and then manage it directly from their desktop. SV9500 UC gives your employees exactly what they want, unencumbered communications that they control. Accommodation of your enterprise communications platform should not stress your existing IT systems. - VMWare ESXi 5.5 and 6.0. Enterprises that rely on multiple operating systems, applications and platforms to keep their infrastructure running cannot afford a costly or stressful communications system deployment. That’s why NEC has given enterprises the option of utilizing the SV9500 platform as a fully virtualized communications solution. In virtualizing your unified communications applications, your organization gets the same great benefits you’ve realized from premises servers in the past, while reaping several new abilities; like the capacity to deploy applications faster, increase performance and availability, and operation automation — resulting in IT that’s easier to implement and less costly to own and maintain. The UNIVERGE SV9500 is now supported on VMware or Hyper-V as virtual appliance, meaning you skip the installation on a network server. Instead, you can now download VMware or Hyper-V-compatible OVA files to integrate NEC’s Unified Communications applications onto your own hardware and existing VMware or Hyper-V operating systems. Reliable, flexible, and cost-effective. Deployment is now that simple. Your employees depend on communication tools that accommodate flexible workspaces and allow free roaming whether they are in the office or outside of it. 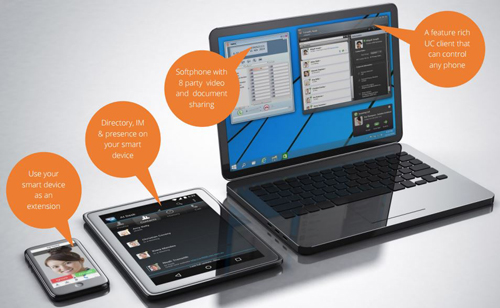 NEC offers many mobility solutions designed to fit specific needs. Our Enterprise Mobility solutions have been designed to give your employees freedom and flexibility through the use of one phone extension and voice mailbox that travels with them and provides access to a wide range of UC capabilities. 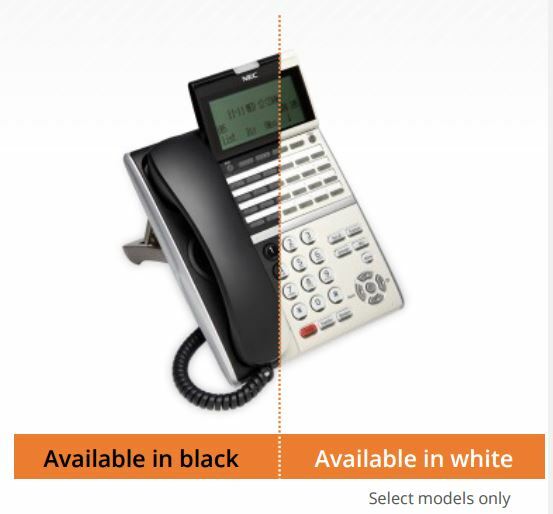 SV9500 UC Mobility allows users to set up their phones to ring on the device of their choice. The phone is also set up according to pre-set rules that consider your current status/availability and who it is that is trying to reach you. Regardless of where you are or who is calling, your office extension will always be your caller ID. And, with the addition of the SV9500 UC’s mobility application, you can provide your employees with enhanced coverage on their mobile devices (iOS and Android) anywhere there is Wi-Fi or 4G. Your employees will gain a consistent user experience and tool-set regardless of which smart device — Apple® or Android™, tablet or mobile phone, they are using at the time. Communication between you and your customers should never be difficult. Today’s customers expect to be able to communicate with your business on their own time in whatever way they choose. SV9500 UC Contact Centre suite provides you with all the tools necessary to make each interaction between your customers and your business quick and easy. Between improved response times, reduced abandon rates, lower operating costs, and increased revenues, both you and your customers will see a return on your investment with the installation of the SV9500 and the SV9500 UC Contact Centre Suite. Customize Your Communications by Industry - Communications technologies should cater to your needs, not the other way around. NEC has a rich history providing communications technology solutions tailored for Hospitality, Healthcare, Education, Government, Finance, Manufacturing, and Transportation based organizations. If you’re looking for a communications solution that meets your industry’s individual needs, we’re the people to talk to. A hospitality environment presents the ultimate challenge for customer service employees and the SV9500 caters to these needs perfectly. With the demand for a mobile, connected workforce growing in the hospitality industry, efficient communications are critical to maintaining high-quality guest services. SV9500 users get access to robust hospitality centric offerings such as the SV9500 UC Attendant’s HotSOS integration which optimizes hotel operations and improves efficiency. Your staff will be able to be productive regardless of location— resulting in increased responsiveness to guest needs. Every hospital administrator wants to streamline clinical workflows and enable better patient care. The SV9500 lets hospitals meet the challenges of healthcare information sharing head on. From managing the flow of the patients in the reception area, to ensuring that physicians, nurses, and staff can be reached from one phone extension wherever they may be in the hospital. The SV9500 is a unique solution that reduces the administrative and process-driven strains on your IT system, so your staff can get back to what they do best: caring for patients. City and state governments are simplifying the deployment, operations, and interoperability of their communications solutions. The SV9500 virtualized platform allows governments to streamline communications and ultimately provide more connected end-user experiences from any location across multiple devices. The SV9500 also improves enterprise telephony with advanced communications features all while running in your own secure, safe environment. Personalization is important to the creation of a smart work environment with motivated personnel. Running your business on an outdated system or forcing employees to use old devices that are ill equipped to handle their multi-faceted communications needs is bad for business. That’s why the SV9500 platform supports the latest range of NEC desktop and mobile endpoints, including the DT800/DT400 series terminals, voice over WLAN and IP and Digitally Enhanced Cordless Telephone (DECT) mobile handsets. NEC’s innovative desktop endpoint design is intended to deliver maximum deployment flexibility, while a wide range of choices allow for multiple combinations that fit any and all business niches or personalization requirements. NEC’s WLAN and DECT telephones give your employees secure, crystalclear communications as they roam about your company’s premises or anywhere else there is coverage, while providing all of the features and functionality of a desktop phone with standard mobile enhancements such as text messaging, push-to-talk, programmable keys, and integration with third party applications. Communication continues to evolve each day, and to keep up, so must your desktop telephone. The increasing technological innovations of smartphones and tablets has led to the creation of a new breed of desktop phone. The new UT880 integrates the traditional desktop telephone and a tablet into one device that provides you with an innovative, feature-packed desktop phone that revolutionises your calling experience. The UT880 also provides you with access to your SV9500 UC desktop client. All UC functionality, from corporate directory, presence, and instant messaging to unified messaging and call control, is available at your fingertips. Depending on your redundancy requirements, multiple nodes are available, including the Primary Node (Main System), the Geo Redundant Node (GR-Node) and the Survivable Remote Node (SR-Node). Geographical Redundancy provides full survavibility of the SV9500 through use of “Standby CPUs” either located in the same facility as the “Primary CPU” or at different geographical locations. Multiple Nodes (CPUs) can be configured in this Geo-Redundant deployment. This provides your operations with unsurpassed survivability options--from small scale sites to complete system redundancy.